Ole Gunnar Solskjaer admitted he had some doubts over Marcus Rashford's ability to convert last gap penalty that secured a famous victory for Manchester United over Paris Saint-Germain. Rashford held his nerve to fire home the spot kick that completed injury-hit United's revival following a 2-0 first leg defeat at Old Trafford, with the 4-3 aggregate win instantly hailed as one of the greatest comeback's in the club's illustrious history. 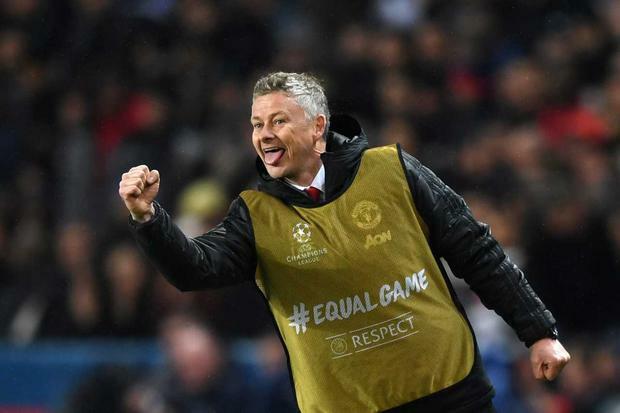 Former United manager Alex Ferguson was among those celebrating in the United dressing room at the final whistle, with interim United boss Solskjaer struggling to sum up his emotions on a night that may well have secured him the Old Trafford hot-seat on a permanent basis. Presnel Kimpembe was adjudged to have handled the ball in the box after a VAR review that handed United their decisive penalty, with Solskjaer confirming he has not watched the incident back on a TV replay. "Of course there’s always doubts (he would miss)," he said of Rashford's penalty. "I was in the Champions League with Molde we had a penalty in the last minute against Basel and we went out so I know what can happen. "Normally Paul Pogba takes the penalties, but Rashford is 21 and there was lot of pressure on the boy, but he showed no nerves, he's fearless. "My staff said the defender made himself bigger so it's a clear penalty and now we can enjoy this moment. This is the reason why you are in football. "The belief in the boys was fantastic. We set out with a plan to get the first goal and we didn't expect it after two minutes, but it made it more open for us. "That's the Champions League. Last night with Real and Ajax was our team-talk, it was probably theirs too. Last year it was Real and Juventus, there's been PSG and Barca too - it's this club, it's what we do, that's Man United. "This is a night to remember and it was great to see the boss (Alex Ferguson) in the dressing room after the game. It is fantastic to be here and enjoying nights like this. "It is the best moment of my coaching career, absolutley. It was unbelievable and now everything is possible. "Of course, we fancy ourselves that we can go all the way but we just have to wait for the draw and take the game as it comes now. "We've had loads of injuries and suspensions but maybe that was a good thing today. It was a fresh team with loads of energy and we knew we had to defend, be humble enough to work hard and we did that." PSG have suffered some big setbacks in the Champions League in recent years and Solskjaer suggested the mental scars from those defeats played a factor in his side's victory in Paris. "There's always mental doubt for them because they have had those experiences," he added. "We always know it is possible to come back. That is what this club is all about. That is Manchester United and we have done it. "Our boys are young and fresh which gave us more energy when we needed that goal." United legend Eric Cantona summed up the mood of United fans as he posted this emotional video clip on social media shortly after the final whistle sounded in Paris.